Four bridges cross the Ulla river near Ponte Ulla, linking the provinces of Pontevedra and A Coruña. Any one of them is an example of its time and the progress of communications; the two railway viaducts are, in addition, authentic wonders of engineering. The oldest bridge is from the mid-eighteenth century. In the area there were other bridges once, but the floods of the Ulla eventually damaged them, forcing the neighbours to use one of the many boats that crossed the river until not so long ago. The one that survived is attributed to an architect from Santiago, Tomás del Río, and the Southwest Way to Compostela passes through it. It ends on Ponte Ulla’s main street, next to the beautiful church of Santa María Madalena, with Romanesque traces on its chancel. The bridge that crosses the river into the current N-525 road is the least interesting of the four and was built in the seventies of last century, when it became evident that the original one was no longer capable of accommodating modern traffic. As for the railroad bridges, the sight of the two overlapping and overcoming the deep precipice is an impressive image. The oldest of the two was built to serve the railroad network plan between Ourense and Santiago. The narrowest pass in the area was chosen for it, in the fierce rocks of the place called San Xoán da Cova. The project was in the works since the 1920s, but the viaduct was not opened until 1958, after over a decade of arduous construction. The result is a beautiful stone bridge with an iron framework, classicist in style and located more than eighty meters above the riverbed. 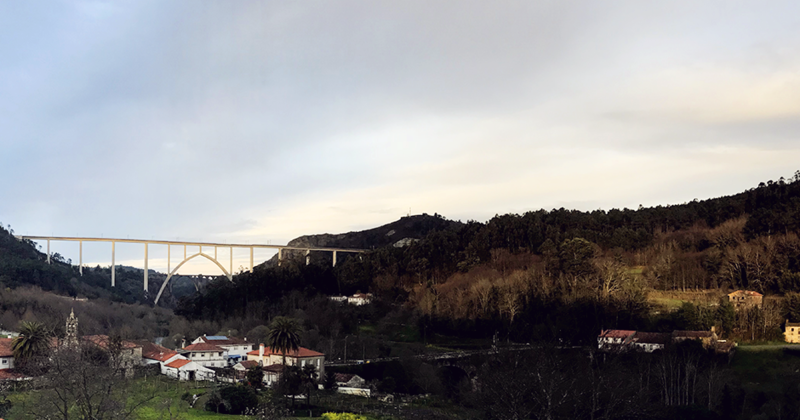 A little ways after its start in Pontevedra, there is a viewpoint with spectacular views of the Ulla region, with a panoramic view that stretches many kilometres and several municipalities nearby. If what you want is to admire the depth of the valley, it is better to do it from the A Coruña side, in the Gundián viewpoint. As for the modern one, designed for high-speed trains to pass through it, engineers had to consider the need to protect such a tall construction from the strong winds that form in such a deep valley, and the fact that the structure is placed between two tunnels. For weeks, neighbours and drivers passing through the lower road could observe a prodigy of technique: two construction vehicles advanced little by little, one from the hillside located in the Concello of A Estrada and the other one from Vedra, to meet with millimetric precision halfway through, over the spectacular pointed arch that supports the structure. The result is the highest viaduct of the Spanish high-speed train network, as the central arch is nearly 170 meters high. Nine columns on the ground and five more on the arch support its 630 metres of length; the design is similar, though updated, to that of its predecessor, and received the 2011 San Telmo Award for best work of civil engineering built in Galicia. The works finished in 2010, giving this natural Ulla pass its current look.